What is a Cirque Plume show ? 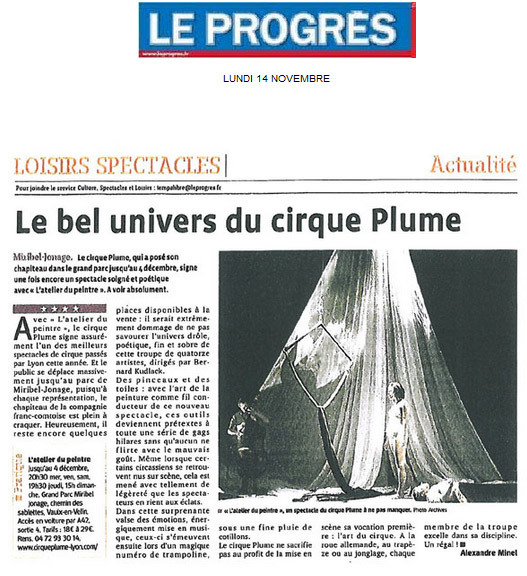 With "L’atelier du peintre", Cirque Plume definitely has one the greatest circus shows seen in Lyon this year. People are going in their droves to the Miribel-Jonage park and the big top is packed out for every performance by the company from Franche-Comté. Luckily, there are still a few tickets left: it would be such a shame to miss the funny, magical, refined yet simple world of this troop of fourteen artistes, directed by Bernard Kudlak. Brushes and canvas: with the art of the painter the connecting thread running through the new show, the artist’s tools become the excuse for a whole series of jokes that are hilarious without ever being in bad taste. Even when some of the performers appear naked on stage, it is all done with such a light touch that the audience fall about laughing. In this surprising dance with our emotions, energetically put to music, they proceed to perform a magical number on the trampoline, under a fine rain of streamers. Cirque Plume doesn’t let anything get in the way of its primary vocation, which is the art of the circus. Whether it’s the German wheel, the trapeze or juggling, each member of the troop excels in his discipline. Truly magnificent!